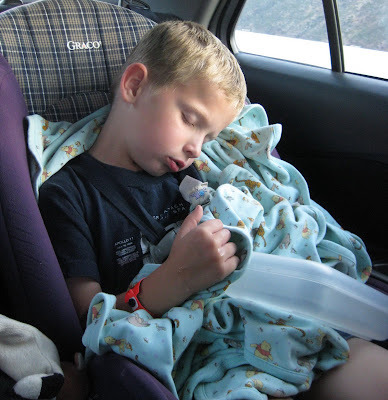 Nearly two hours into the drive, Ben announced that he felt like he was going to throw up. His face, including his lips, were paper white which was a frightening thing to behold. We took away his book and told him to look out the window. I crushed half a Benadryl, mixed it with some of Daddy's whipped cream from his Starbuck's Frappacino and told him to swallow it. Twenty minutes later he was sound asleep, drooling all over his hand. 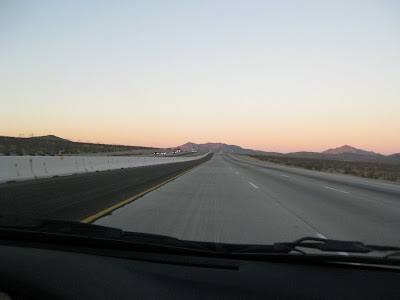 Driving towards Las Vegas we are reminded why we love California so much. It has everything. Beaches, mountains, deserts, miles of wide open spaces, cities, ranches, you name it. 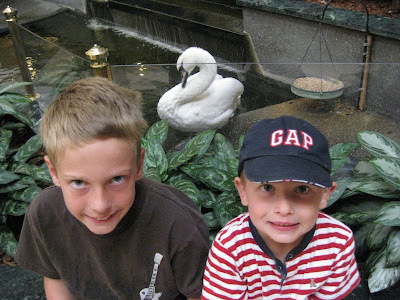 Our hotel lobby had a large pond with koi fish and two Royal Swans named Elvis and Priscilla. The boys enjoyed watching them snooze, eat lettuce, and generally ignore all the guests at the hotel. 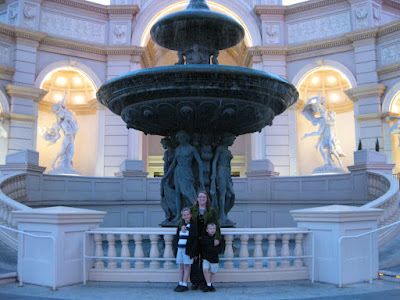 Outside the Monte Carlo where we saw the Lance Burton Magic Show. The weather this weekend was perfect, toasting warm during the day for swimming, and breezy and cool in the evenings for strolling down the Strip. 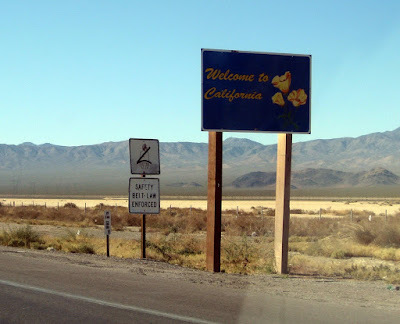 After all the glitz and glamour of the bright LED billboards in Vegas and at Stateline, this completely understated "Welcome to California" sign was underwhelming. 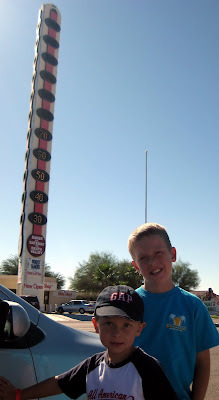 And what would a trip to Vegas be without the obligatory photo in front of the World's Largest Thermometer in Baker, CA be? Nothing I tell you. It used to be the home of the Bun Boy Restaurant, a name that brought fits of giggles to my little brother and I when we made this trip with our parents as children. Now there is just a small gift shop and gas station surrounded by fast food chains that have popped up in this desert depot.